Everything about the Garden Village Resort is unique – from the luxurious glamping tents and rejuvenating spa treats on offer to the fantastic garden restaurant, where you can sit on natural grass in the shade of mighty trees while a stream flows between the tables. The accommodation is stylish and comfortable, the Village is exceptionally well thought out, and the natural surroundings are nothing short of sensational. Come and relax in this beautiful unspoilt part of the world. There are six glamping tents each of which sleeps up to four people. 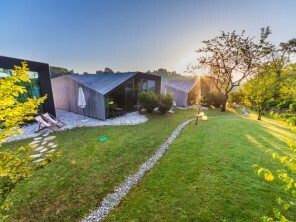 Each tent has two bedrooms (one on each floor), a bathroom with a shower and an opening glass roof, a couch, a minibar and a TV. There are also nine tents on piers by the stream and fishpond – these are smaller with separate restrooms but they are perfect for two. Each tent sits on its own glade with privacy and shade guaranteed by bushes and trees. There are outdoor heated tubs in which to relax or there is a sitting area where you can have a drink and enjoy the peace and quiet. 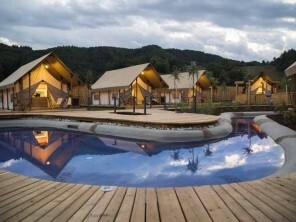 From 200€ - €340 per treehouse per night (tents sleep 2-4 each). PRICE INCLUDES: overnight stay with breakfast at the selected accommodation, free WiFi through out the resort, computer in the lobby, parking, baby cot, bed linen (change once a week when staying longer), 2 towels per person (change every three days) , 1x entrance to Finnish sauna (when staying min. 3 nights). SURCHARGE: Tourist tax: 1,27€ per day/adults, 0,64€ per day/ children 7-18 years old, Final cleaning: 20€ when renting a tree house, glamping tent or apartment/ 10€ when renting a pier tent, 5th person in the accommodation - 30€ per day, When staying less than 3 nights in low season- 20% surcharge, Entrance to Finnish sauna 45 min (2nd entrance or more) – 8€, extra towels - 2€ per piece, bathrobe – 5€ per piece.